Whether you’re 5 or 50, investing in a straighter smile can help you enjoy better oral health in the future. At Vision Dental, our Menai family dentist offers a range of orthodontic services for patients of all ages. In fact, it’s one of Dr Stephen Suster‘s favourite services to provide! Our comprehensive orthodontic services include early orthodontic treatment, growth modification therapy, Clear Correct transparent braces and the revolutionary Rapid Smiles system. Every orthodontic treatment plan that we provide includes a cost analysis of your proposed treatment, as well as potential insurance benefits. 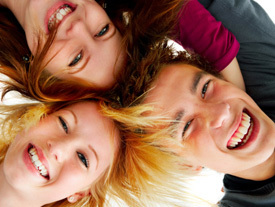 Are you thinking about orthodontics for you or your child? We’d like to offer you a completely free, no-obligation consultation with our experienced dentist. There’s a lot to smile about at Vision Dental. Call (02) 9543 4222 or book online today! We also offer 0% interest free financing and monthly payment options.